« Comfort food » at its best! Not really summery, I grant you, but ideal if you crave for a simple and really good dish. The recipe comes from Jamie Oliver’s latest book « Jamie at home ». This book is really good, but since I am a massive fan of the man, I am not entirely objective! 200ml balsamic vinegar (don’t use the most expensive!!). 2 glasses of white wine. Preheat oven to 200°C. Cook the potatoes in a large quantity of boiling water for 8 minutes. Drain and set aside. To prepare the meat, place the chopped rosemary leaves on a wooden board. And salt and pepper, and fennel seeds. Roll the meat on the wooden beard to coat with the chopped herbs. Heat a little olive oil in an ovenproof dish on the stove. Brown the roast on all sides. Add pressed garlic, chopped onion and celery to the dish. Place the dish in the bottom of the oven and cook for 1 hour. For the potatoes, get a big roasting tin. Heat some olive oil in it, add the butter, garlic and rosemary. Finally place the potatoes and onions. Mix well to coat with oil. Pour in the balsamic vinegar, salt and pepper. Bake in the upper side of the oven for 50 minutes. Stir the potatoes halfway through cooking. After an hour, the meat should be cooked. If not, continue cooking for 15 minutes, keeping the potatoes warm. When the meat is ready, remove from pan and let stand for about ten minutes. Remove as much fat as you can from the dish, and crush remaining onions and garlic with a fork. Place the dish on the stove and deglaze with white wine. Simmer until liquid has reduced by half. Adjust seasoning if necessary. Filter the sauce and pour into a small bowl. 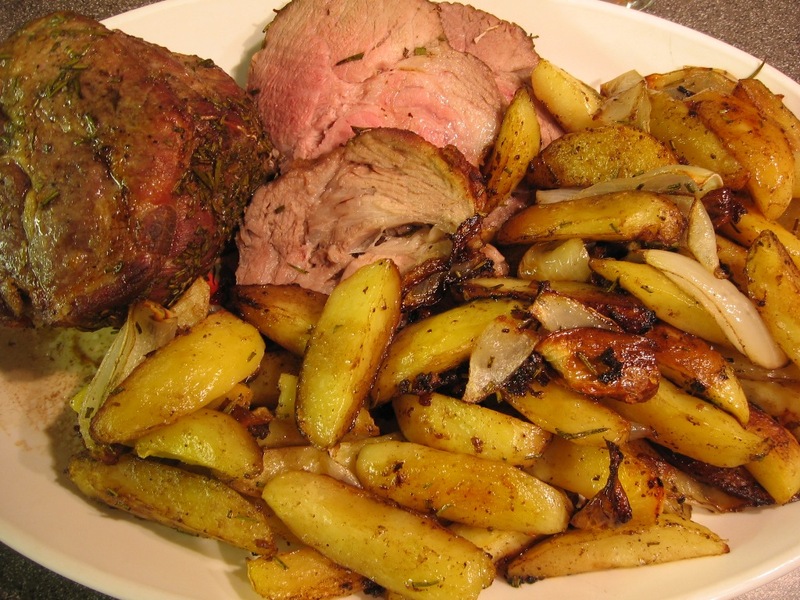 Slice the pork roast and serve with the potatoes and onions, and the sauce.